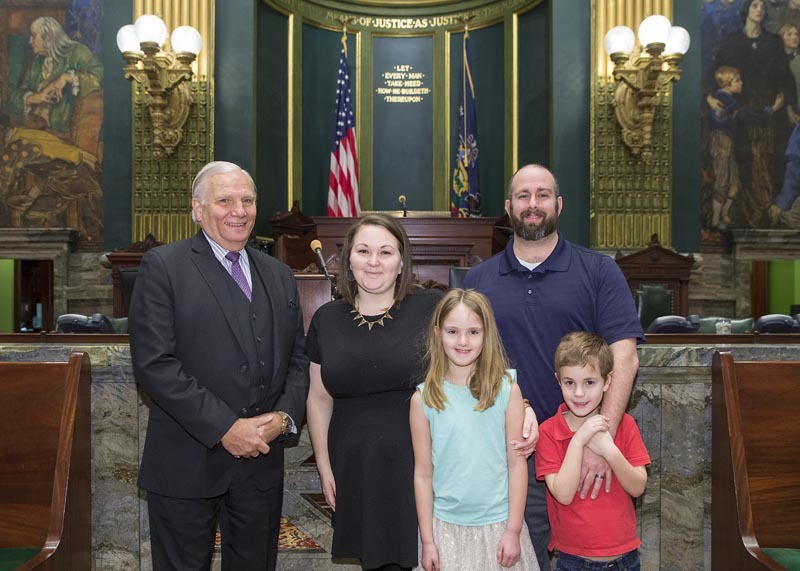 Senator Mensch was pleased to welcome the O’Donnell family to Harrisburg. You can view their introduction here. This edition of the Mensch Report features my tour of The Open Link and The Center at The Open Link with Executive Director Stuart Bush and his staff. 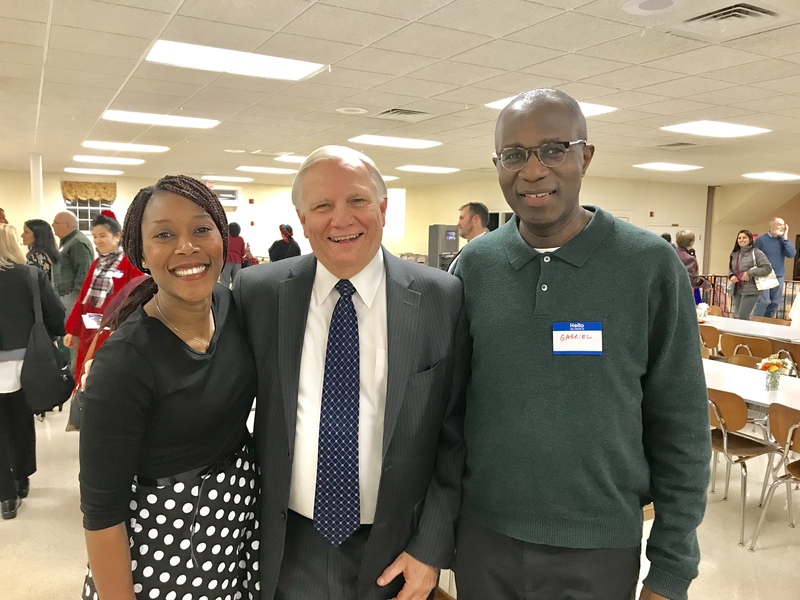 The Open Link is a multi-service agency serving the greater Upper Perkiomen Valley, providing services and programs that promote socialization and volunteerism for people of all ages to lead healthy and productive lives. 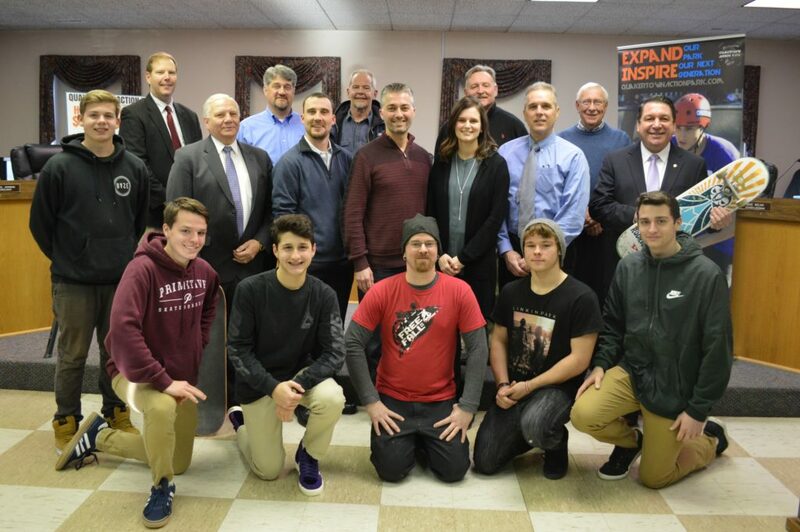 Senator Mensch and State Representative Craig Staats held a press conference to highlight two grants that Quakertown Borough received to revitalize and improve Quakertown Main Street Skatepark. Read more here. 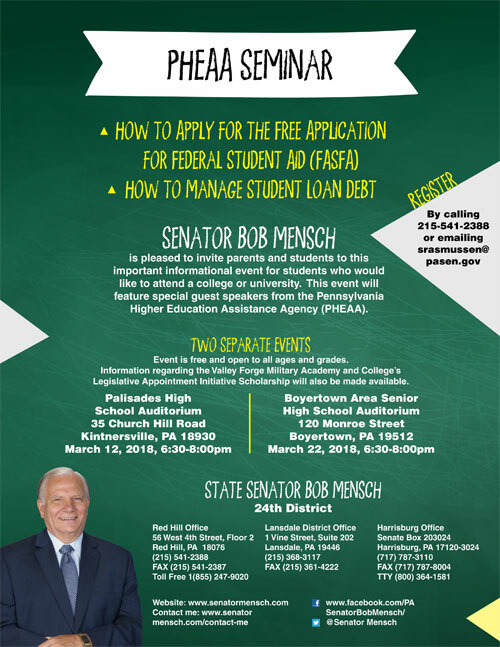 I encourage parents and students to attend one of my upcoming seminars which will focus on how to apply for the Free Application for Federal Student Aid (FASFA) and how to manage student loan debt. The seminar will be led by representatives from the Pennsylvania Higher Education Assistance Agency (PHEAA) who will provide helpful information, guidance, and resources. This event is free and open to all parents and students from any school district. Please register by calling 215-541-2388 or by emailing srasmussen@pasen.gov to reserve your seat. Pease also indicate which event you are attending when you register. My office has Pennsylvania tax forms available for individuals. Please call my district office at 215-541-2388 to request the forms. Forms can be mailed to constituents or picked up in person. Unfortunately the IRS is no longer supplying bulk shipments of tax forms to organizations including my office. IRS forms can be downloaded here. Constituents can also order IRS forms and publications to be delivered by mail. 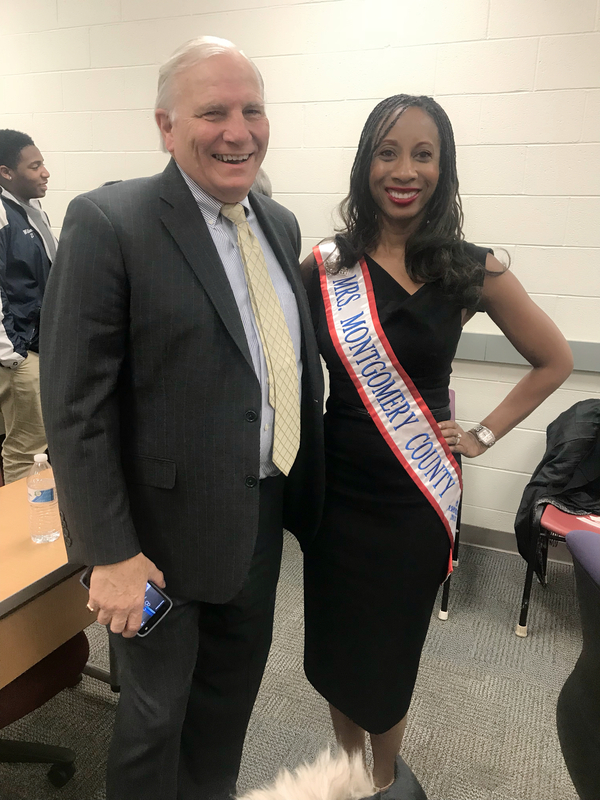 Senator Mensch was pleased meet Nikki Johnson-Huston, Mrs. Montgomery County PA America 2018, at the Pottsgrove NAACP meeting. 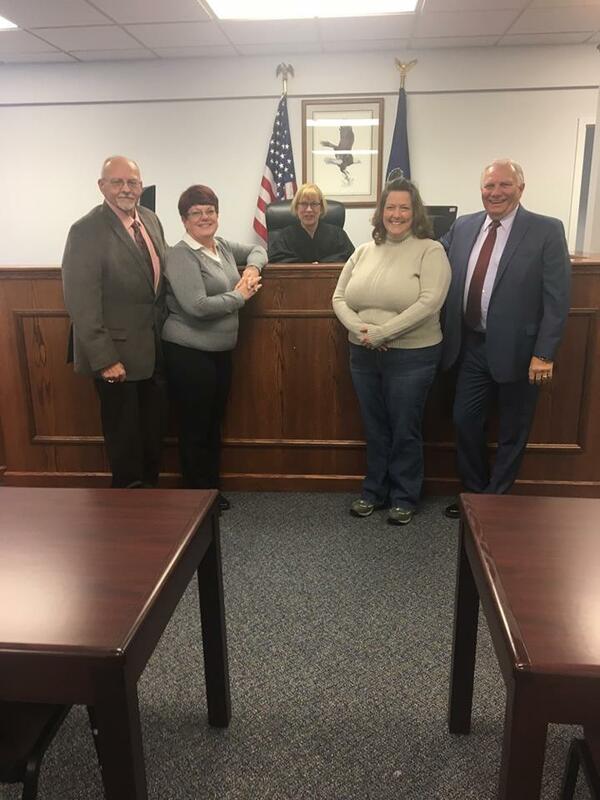 The Property Tax/Rent Rebate Program benefits eligible Pennsylvanians age 65 and older; widows and widowers age 50 and older; and people with disabilities age 18 and older. The income limit is $35,000 a year for homeowners and $15,000 annually for renters, and half of Social Security income is excluded. The Property Tax/Rent Rebate Program is one of five programs supported by the Pennsylvania Lottery. Since the program’s 1971 inception, older and disabled adults have received more than $6.7 billion in property tax and rent relief. The rebate program also receives funding from slots gaming. Applications are now available in my office. Forms are available for pick up or we can mail them to you. To request a form, please call 215-541-2388 or stop by my office during our office hours. The application forms are also available online for eligible residents to begin claiming rebates on property taxes or rent paid in 2017. 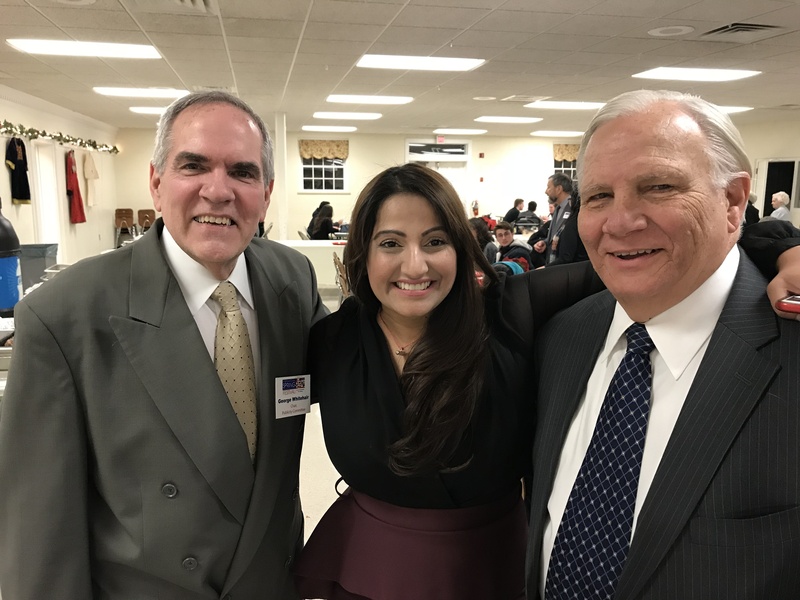 It costs nothing to apply for a rebate, and the department reminds residents that applications and free filing help are available at no cost from Department of Revenue district offices, local Area Agencies on Aging, senior centers and state legislators’ offices. My offices are also available to help applicants complete the form. The deadline to apply for a rebate on property taxes or rent paid in 2017 is June 30, 2018. Rebates will be distributed beginning on July 1, 2018 as specified by law. The Pennsylvania Department of Transportation (PennDOT) reminds customers that Pennsylvania is under an enforcement extension from the Department of Homeland Security until October 10, 2018, which means that Pennsylvanians may use their current driver’s license or ID card to board commercial aircraft or enter federal facilities that require ID until at least that date. The Department of Homeland Security (DHS) has stated that beginning January 22, 2018, travelers who have driver’s licenses issued by a state that is not yet compliant with REAL ID and that has not received an extension will need to show an alternative form of acceptable identification for domestic air travel. Because Pennsylvania is currently under a REAL ID extension, travelers with PennDOT-issued driver’s licenses or ID cards may continue to use their licenses as usual. A federally-accepted form of identification (whether it’s the forthcoming Pennsylvania REAL ID driver’s license or ID card, a U.S. Passport/Passport Card, a military ID, etc.) must be used as identification to board a commercial flight or visit a secure federal building on and after October 1, 2020. PennDOT anticipates that REAL ID-compliant driver’s licenses and ID cards will be available to customers that want them in spring 2019, and will continue to apply for extensions from DHS until becoming REAL ID compliant. More information about REAL ID, including frequently asked questions and information on documents required for REAL ID, can be found at www.penndot.gov/REALID. The U.S. Department of Homeland Security has issued a bulletin regarding a security vulnerability that affects nearly all business and personal computers, and which may also affect mobile devices and smartphones. Below you will find a hyperlink to Homeland Security’s US-CERT Bulletin detailing the vulnerability and security patches that are available. According to the Pennsylvania Department of Revenue, now is a good time to prepare to file your 2017 personal income tax returns. Information is available to familiarize yourself with E-filing options which reduce paperwork, decrease errors, instantly confirm the filing, facilitate faster refunding and expedite direct depositing. Electronic Filing Options in 2018 for the 2017 tax year will include Padirectfile, E-filing for Free, and E-filing for a Fee through paid tax preparers and commercial tax preparation software providers. If you received more than $33 in total gross taxable income during 2017, your PA personal income tax return must be filed no later than midnight Tuesday, April 17, 2018. 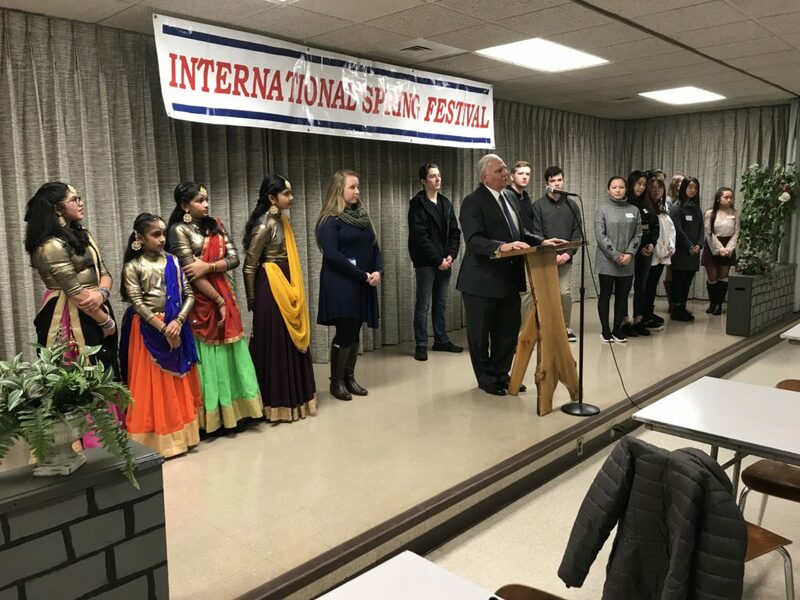 Senator Mensch participated in the 27th Annual International Spring Festival‘s Kick-Off Celebration at Dock Mennonite Academy High School. Low income families struggling with heating bills may apply for the Low-Income Home Energy Assistance Program. Eligible Pennsylvanians may choose one of three methods to apply for a 2017-18 cash grant sent directly to the utility company or a crisis grant for households in immediate danger of being without heat. Applications may be submitted online through COMPASS or at your local county assistance office through April 6, 2018.